Slice the ends off of the oranges, score the peel from one end to the other, and remove the peels off the oranges.Slice the peels into thin strips and trim the edges. Using a medium size pot, place the peels in boiling water and blanch them for a few minutes. Rinse the peels, and repeat this process a second time (it's best to use cold water again for the second time to repeat the process). This is done to remove the bitterness of the peels. Prepare the simple syrup by combining the water and sugar in a pot. Bring the syrup to a simmer, place the peels in the pot, and simmer for 20 mins. Once the peels have cooked, remove them from the pot, and place on a rack to cool and drain. Melt dark chocolate over a double boiler or microwave. 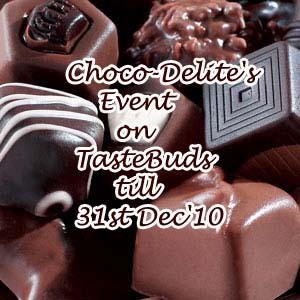 Just heat the chocolate in short intervals in the microwave, stirring and checking the temperature after each time. If you go over the max. temperature, just add small pieces of the original solid chocolate until it drops back down to the max. temperature.Dip the candied orange peels in the chocolate, remove them quickly, and let them cool on a piece of parchment paper. Allow it to rest for an hour. Store and refrigerate orangettes in an airtight container or pack them up to gift your loved ones. This recipe serves about 30-40 orangettes. My tastebuds: I loved them! Even now I'm biting into one while writing this post. 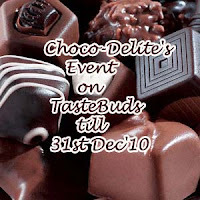 This is my submission to Gulten-Free Holiday, hosted by Tasty Eats At Home, to Choco-Delite's Event, hosted by Taste Buds, to AWED - French, hosted by Priya's Easy n Tasty Recipes and Chefinyou and to The Chocolate Fest, hosted by Cook-curry nook. Wowww i dont bother to grab some orangettes, soooooo irresistible. These remind me of Terry's Chocolate Oranges! Like your blog Megha. Good stuff. Oh you reminded me that i want to learn to make these this holiday season! They are so pretty. Thanks for linking up to gf holiday. Yum, I can almost smell the orange! These look delicious. Great post! These would make lovely holiday gifts. Just wanted to let you know that the Weekend Herb Blogging #262 roundup is now posted. Thank you for sending in a recipe this week.